Apple’s MacBook is a decent notebook, but it has problems, particularly in performance. Its Core M processor just isn’t as quick as some users desire. Enter Asus, and the Zenbook 3, which asks a simple question. Why compromise? 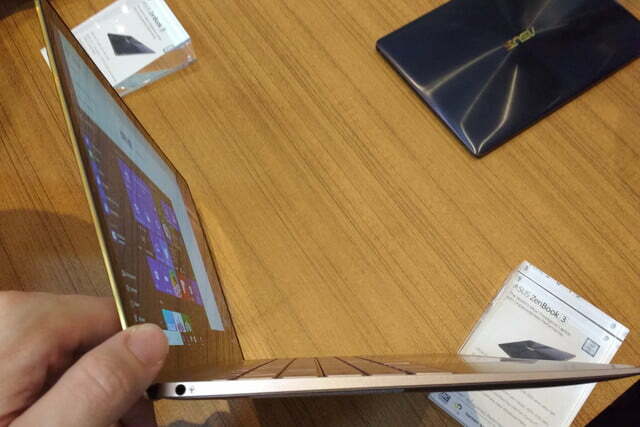 Core M is efficient, but is it really necessary to create a super-slim, portable system? Asus doesn’t think so. 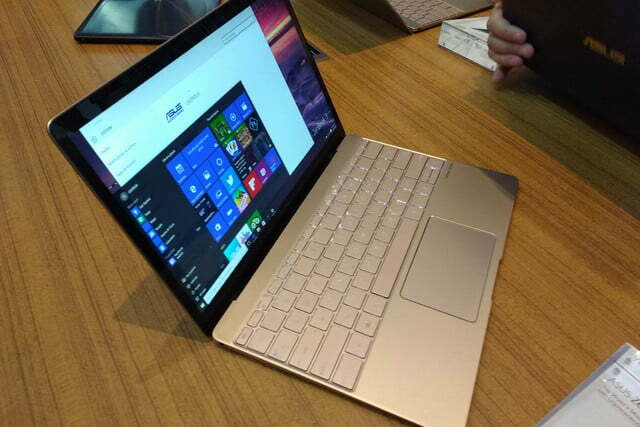 And hopes its latest notebook — which can be purchased with up to a Core i7 dual-core — will be the proof. 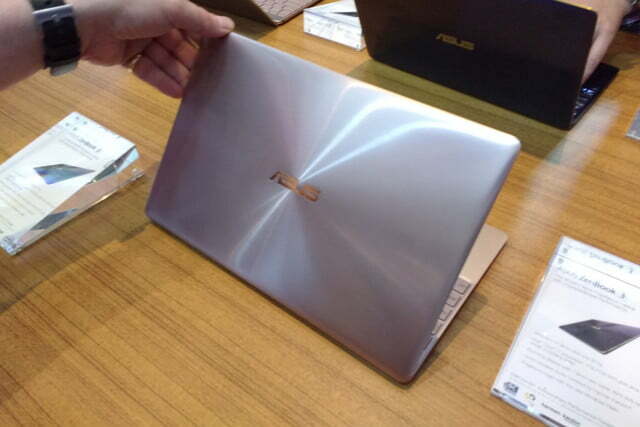 The new Zenbook 3 looks very similar to Apple’s MacBook at first glance. And second. And third. The shared use of all metal-design with a broad, single display hinge and speakers above the keyboard makes the resemblance uncanny. Yet there are major differences. The Zenbook 3 has a smaller touchpad, and matches the color of the keys to the body, decisions that create some distance between the Apple and the Asus. More importantly, the Zenbook 3 boasts the shiniest version of the brand’s distinctive, circular pattern that we’ve seen in years. Fingerprint magnet? You bet. But it does look wonderful when clean. The specifications peg the Zenbook 3 at no thicker than .46 inches, and it weighs in at just a sliver above two pounds. These numbers feel appropriate when the system is handled. It’s hard to believe it’s an actual, working notebook – but then you open it, and the thin-bezel display turns on. Yes, the new Zenbook 3 has bezels that rival the Dell XPS 13. And they’re needed. 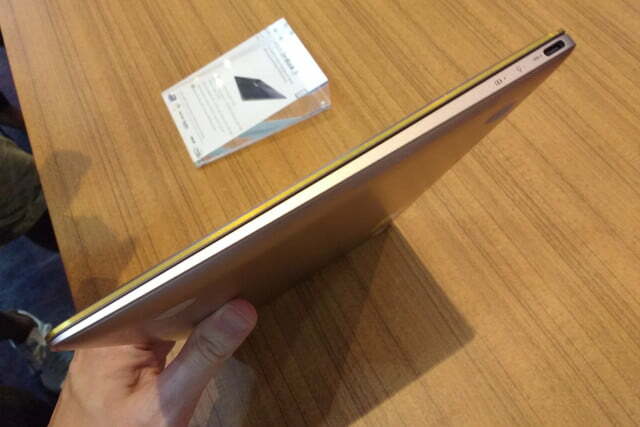 While the system is similar in size and weigh to a MacBook, it actually has a slightly bigger 12.5-inch display. That may not seem like a big deal, but the extra screen real estate is noticeable. The MacBook’s screen comes across as a serious downgrade, in terms of usable real-estate, if you’re used to a 13-inch ultrabook. The Zenbook 3 is still small, but more tolerable in day-to-day use. We weren’t surprised to hear Asus talk up the keyboard. That’s one of the MacBook’s biggest flaws, and any competitor needs to address how it’ll fix it. The Zenbook 3 claims to do so the old-fashioned way – double the physical key travel. It was clear the Zenbook 3’s keyboard has the MacBook beat. 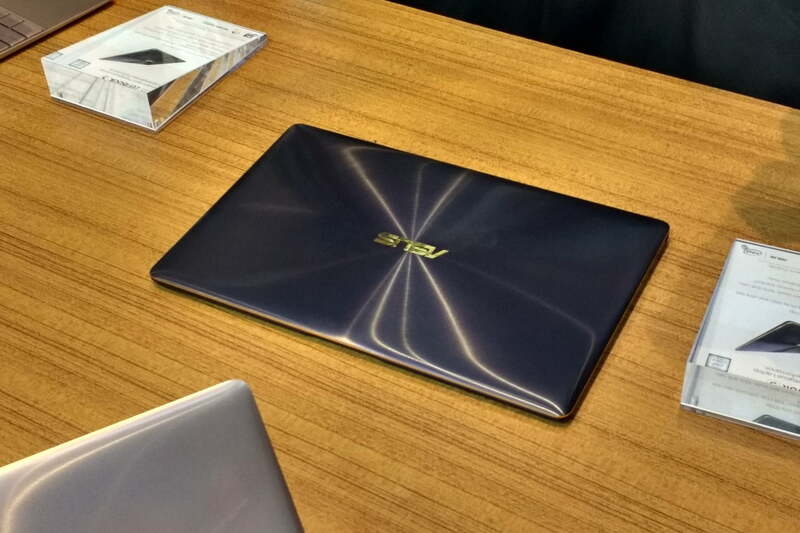 The few minutes we spent with the new Zenbook made it clear Asus has beat Apple in this area. We immediately noticed the extra key travel, and it helped us more readily tell when a key was activated. 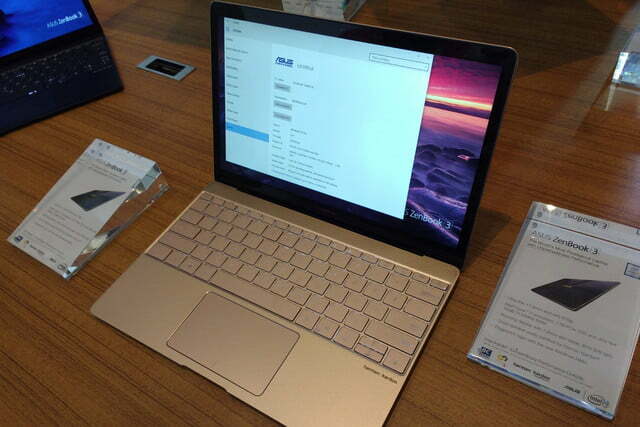 Asus has made the keyboard edge-to-edge, so the layout didn’t feel in the least bit cramped. But that’s not to say the keyboard is perfect. The key travel is alright, but it’s still a step behind the best ultrabooks. That’s notable because Asus itself makes some of the best ultrabook keyboards around – the Asus Zenbook UX305CA’s keys are superb. Compared to that standard, the Zenbook 3 feels vague and imprecise. The touchpad is a similar situation. It seems fine. But only that – fine. If the MacBook is the benchmark the Zenbook 3 is to be judged against, then this is one area it doesn’t match up. The surface appears a bit smaller (we’d have to measure to be sure) and lacks the wonderfully smooth feel of the MacBook. The processor inside the Zenbook 3 is a standard Core mobile chip, rather than the less powerful Core M. That is a key selling point. Our reviews have consistently found that Core M is about 30 percent (or more) behind “standard” Core. We can’t judge the performance of the Zenbook 3 on the show floor. But performance doesn’t deviate much, so we expect the entry-level model will be competitive with the MacBook Air and mid-tier Dell XPS 13, while the high-end model will run with the quickest laptops around. The big question is not if the processor will perform, but instead if the Zenbook 3 will keep its cool. The big question is not if the processor will perform, but instead if the Zenbook 3 will keep its cool. A fan that’s just 3 millimeters thick is required to keep the laptop’s thin profile, and it probably doesn’t push a lot of air. For what it’s worth, the floor models didn’t feel overly warm. Battery life is another concern. Asus quotes nine hours — an optimistic figure. The battery is rated at 40 watt hours, which is not tiny, but also not large. For reference, the Asus Zenbook UX305UA, with a 45 watt-hour battery, hit almost nine hours in the iMacro web browsing test. We expect the Zenbook 3 will achieve seven to eight hours in the same test. There’s a lot to like about the Zenbook 3, at least when compared to its target, the MacBook. Asus’ ultrabook is faster. It has a better keyboard. It’s less expensive. 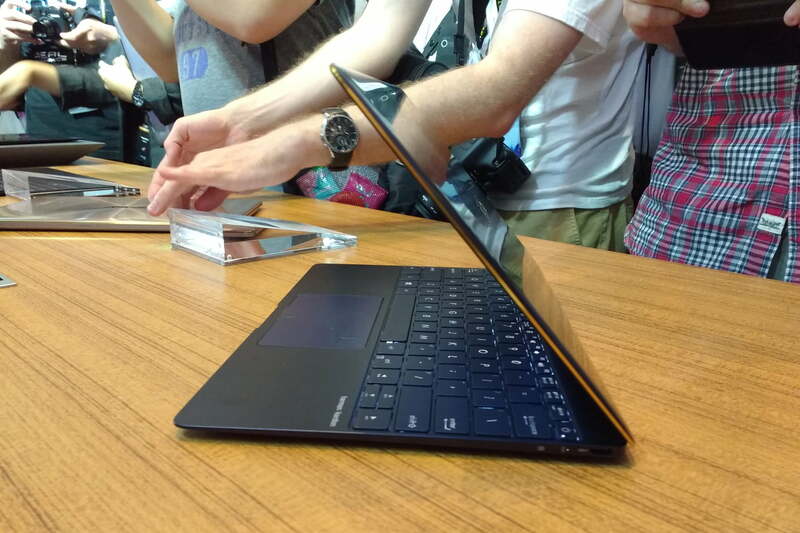 We’re not blown over by this Zenbook just yet, however. Asus’ other models, while not always the most attractive, are an incredible value. The Zenbook UX305CA is super-light, but only $700 (and it’s actually $600 at many retailers). The UX305UA offers competitive performance and strong battery life for $750. The Zenbook 3, at $1,000, is comparatively expensive. And we’re not sure it has much to offer except a smaller footprint. Asus’ problem is that it’s already raised the bar so high, that hurdling it will be a herculean task. But that, as problems go, isn’t a bad one to have.